In 1791, at the age of 19, watchmaker and goldsmith Jean-François Beautte designed his first watches, and created a manufacturing company in Geneva. Some 60 years later, watchmaker Constant Girard founded the Girard & Cie firm in 1852 in La Chaux-de-Fonds, Switzerland. 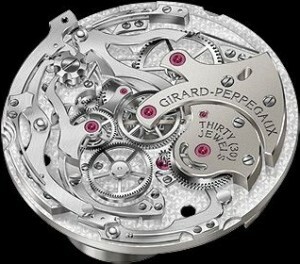 After he married Marie Perregaux in 1854, the Girard-Perregaux Manufacture was faunded in 1956. In 1906, Constant Girard-Gallet, who had taken over the company from his father, took over the Bautte House and merged it with Girard-Perregaux & Cie. Thus Girard-Perregaux claims 1791 as the founding year. 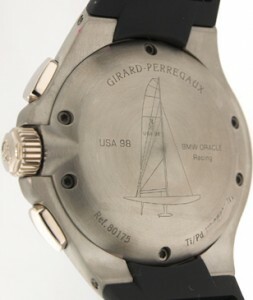 Girard-Perregaux has been sponsoring the BMW Oracle Racing team since 2005. 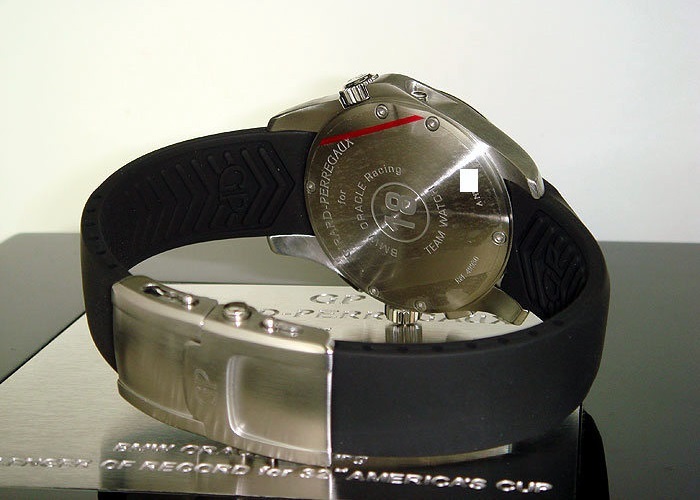 And in the run-up to the 32nd America’s Cup in 2007 the brand launched the left-handed R&D01 – USA 87 Limited Edition, named after the teams earlier yacht, the USA 87. 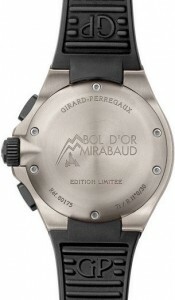 The watch was presented in 2 versions with either a silver or a black ring, together limited to 750 pieces worldwide. There was also a third model, but not for sale, the Team Watch (see below). 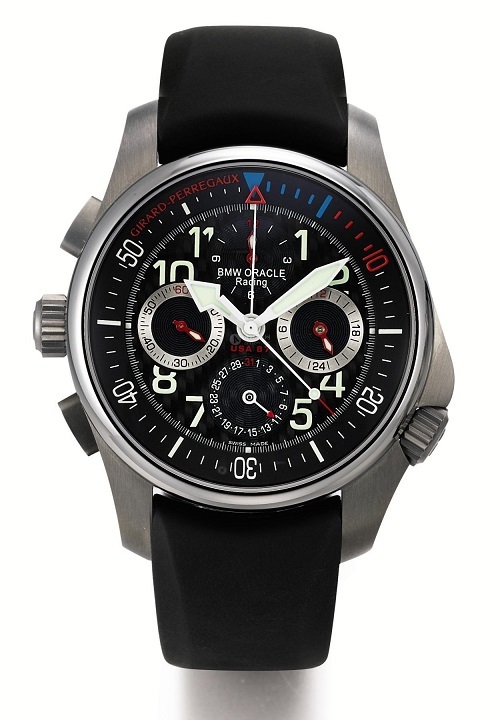 It houses a standard fly-back chronograph, and the dial has a 10 minute regatta scale along the outer edge. 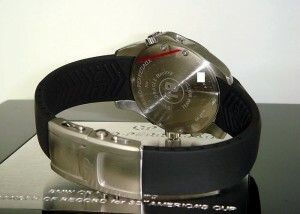 R&D01 – USA 87 Limited Edition, with silver or black ring. 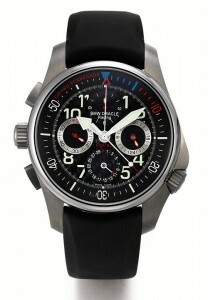 Model: Girard-Perregaux R&D01 – USA 87 Chronograph. Reference: 49930-21-613-FK6A titanium case with silver ring, rubber strap. 49930-21-613-AFK6A titanium case with black ring, rubber strap. 49930-21-011-Y21A titanium case and bracelet, with black ring. 49930-11-614-FK6A steel case with rubber strap, team watch. 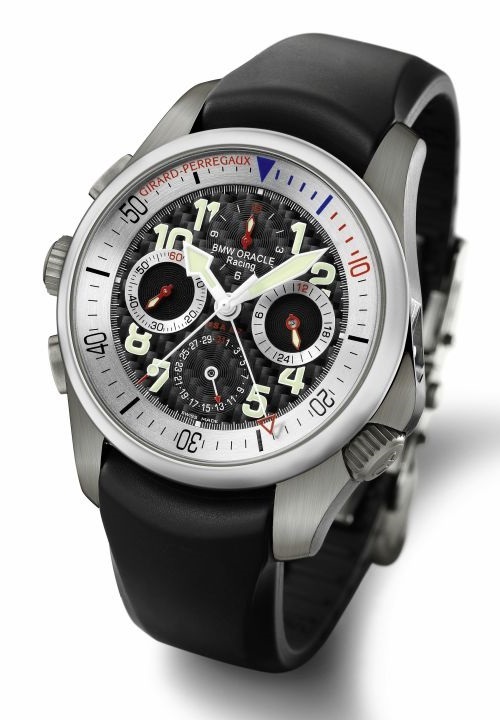 Caliber: automatic GP033C0 fly-back chronograph. 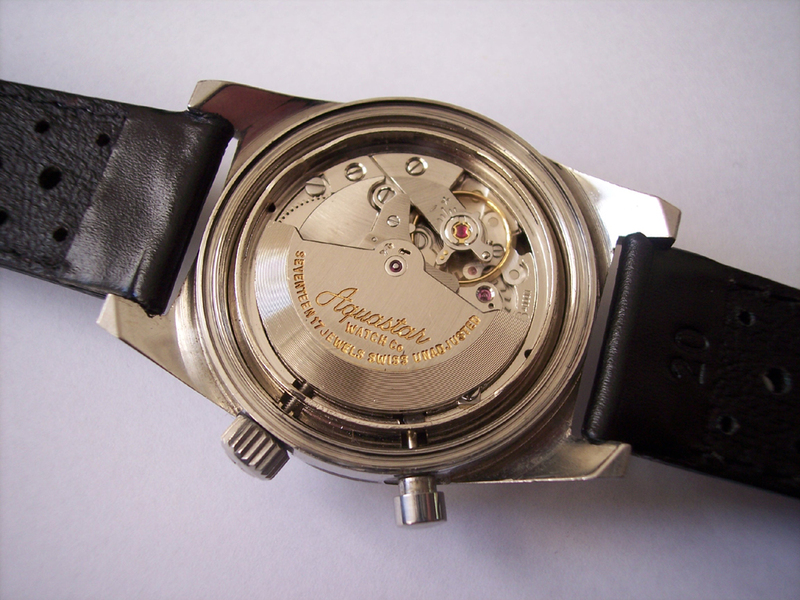 Case size: Ø 43 mm / H 13,7 mm. The ‘Team Watch’ aka ‘18th Man’. America’s Cup race yachts allow for a crew of 17 sailors, of which each sailing member bears a personal crew number. The Team Watches are especially developed by Girard-Perregaux and became part of the official gear, and each piece is individually numbered just like the garment. 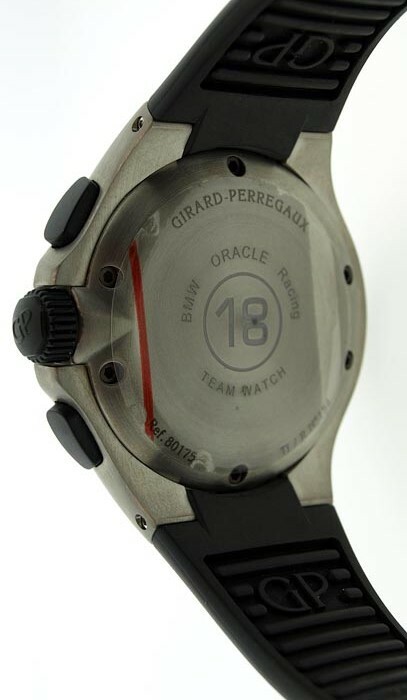 In addition to these individually numbered watches, a series of watches engraved with the central number 18 (as a reference to the 18th man) is given to the other team members (designers, organization, etc.). The 18th man is the team ‘closest’ supporter since this is the name given to the person invited as a privileged spectator to join the 17 crew members on board an America’s Cup yacht during the race. The 18th men Team Watches are not for sale. 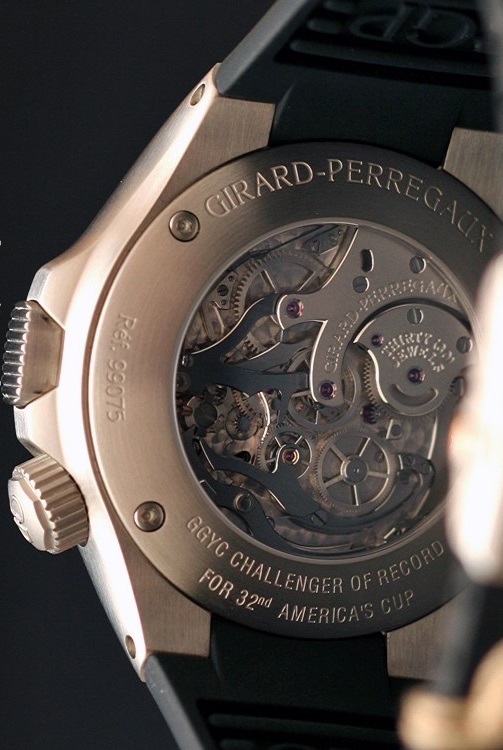 Girard-Perregaux R&D01 – USA 87 Team Watch, numbered 18 on the caseback. 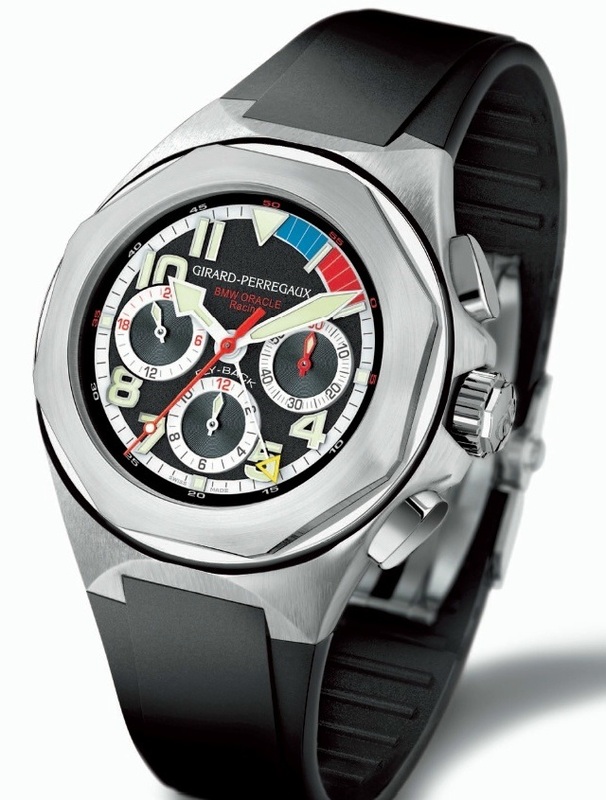 In 2007 Girard-Perregaux again introduced new watches in the ‘BMW ORACLE Racing’ series. 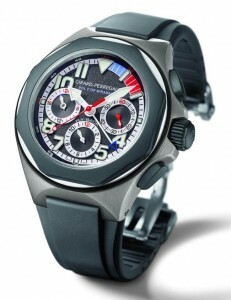 First a new model in the Laureato line, the Girard-Perregaux Laureato USA 98. 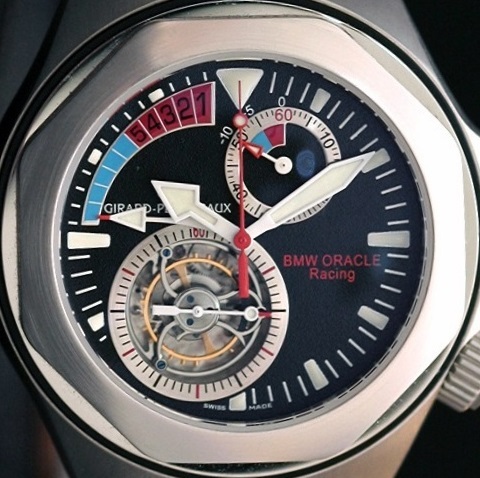 Named after the new yacht that the BMW Oracle Racing team had built for the 1997 America’s Cup, the USA 98. It houses the same standard GP033C0 chronograph and the dial again has a 10 minute regatta scale along the outer edge. 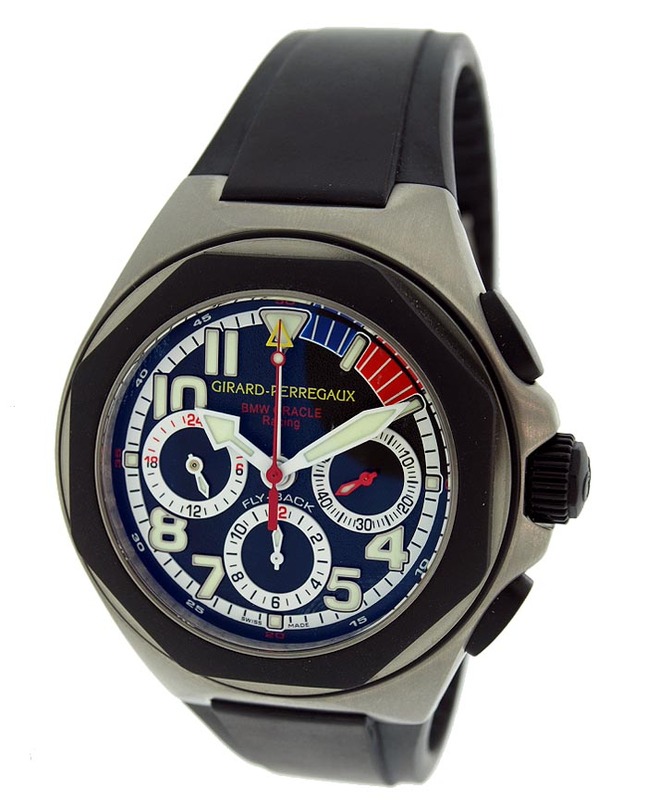 The Girard-Perregaux Laureato USA 98 watch was presented in 7 different versions, all limited editions, including a Team Watch for the crew and the team members. Both versions with the 18K pink golden case have an extra subdial at 12 o’clock with a date register. Laureato USA 98 with a DLC treated titanium, titanium palladium or 18K pink golden case. 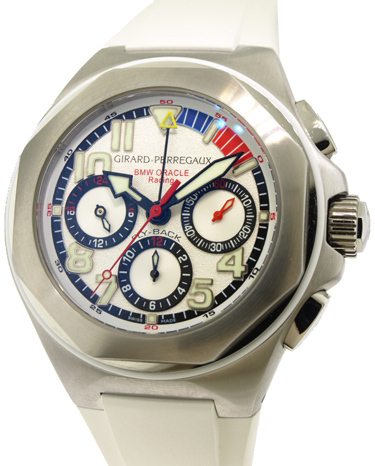 Model: Girard-Perregaux Laureato USA 98.
limited to 150 pieces. Team Watch. Caliber: automatic GP033C0 flyback chronograph. Case size: Ø 46 mm / H 15,6 mm. Again there was a Team Watch for the crew and the team members. Team Watch (number 18), limited to 150 pieces. The second new model, released in 2007 for the BMW ORACLE Racing series, is certainly the most interesting. The Girard-Perregaux Laureato Regatta Tourbillon Chronograph , incorporated a complete new caliber, the GPV02, and was limited to just 32 pieces. The extraordinary design of this watch combines a Flying Tourbillon and an exceptional 10-minute countdown mechanism, operated by a single pusher. 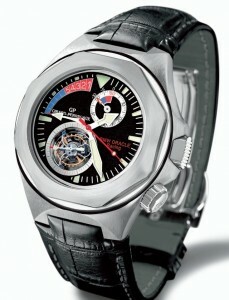 Laureato Regatta Tourbillon Chronograph with open caseback. Model: Girard-Perregaux Laureato Regatta Tourbillon Chronograph , limited to 32 pieces. Reference: 99075-53-631-BM6A with 18kt white-gold case, black dial and black leather strap. Caliber: manual wound GPV02 single-button fly-back chronograph. Caliber GPV02 has the crown to set the hands at 4 o’clock, a sub-second register inside the tourbillon at 7 o’clock, a 60-minute subdial with a coloured 10-minute countdown at 1 o’clock, and a second countdown scale (indicator) is displayed in a zone between 9 and 12 o’clock. A single pusher at 3 o’clock operates the various functions start, stop and reset. At the 10-minute gunshot the pusher starts both the chronograph and the countdown indicator (the column-wheel activates the chronograph and the countdown mechanism simultaneously). The time remaining until the start can be read on both the subdial and the countdown indicator. At the second gunshot both show 5 more minutes to go. With the last gunshot, at the start of the race, the countdown indicator is at zero and stops, but the counter at 1 o’clock instantly takes over to measure the duration of the race. Activating the pusher a second time will stop the chronograph, and pushing it again will reset everything to zero. Size: 14″ Ø 32 mm / H 8,6 mm. Power reserve: min. 72 hours. Organised for the first time in 1939, the Bol d’Or Mirabaud has become Europe’s biggest inland regatta, held on the Lake of Geneva, Switzerland. 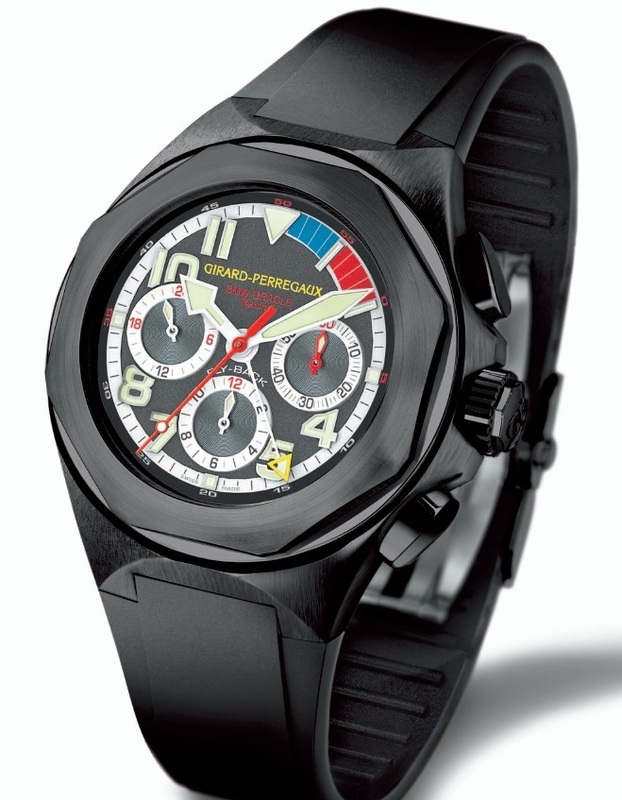 Being the presenting sponsor for the second year, and to celebrate the 70th edition of the Bol d’Or Mirabaud in 2008, Girard-Perregaux presented the Laureato Bol d’Or Mirabaud chronograph , in a limited edition of 30 pieces. 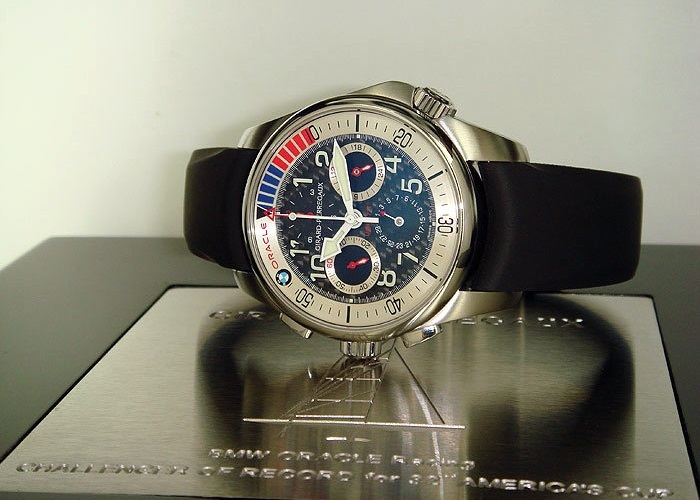 It houses a standard fly-back chronograph, and the dial has a 10 minute regatta scale along the outer edge (equal to the Girard-Perregaux Laureato USA 98 models). Laureato Bol d’Or Maribaud limited edition. 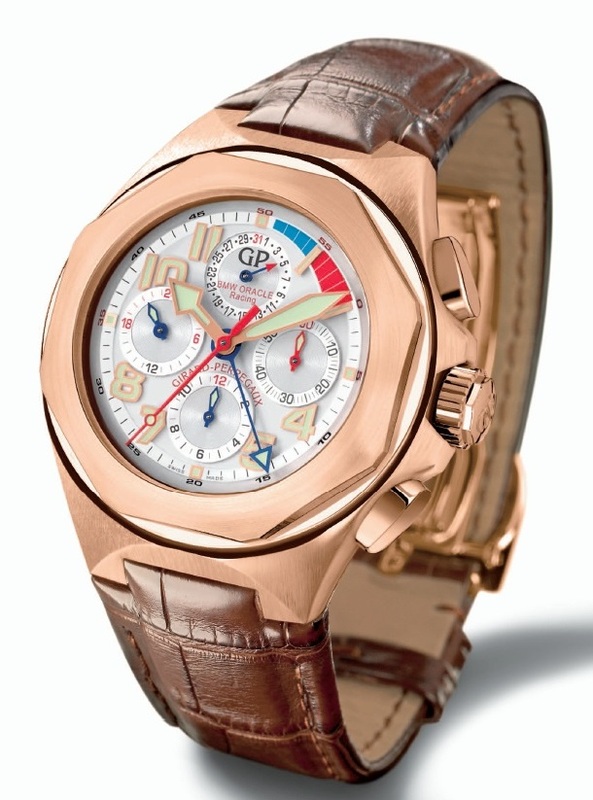 Model: Girard-Perregaux Laureato Bol d’Or Mirabaud, limited to 30 pieces. Reference: 80175 titanium case partially rubber coated, with black rubber strap. Caliber: automatic flyback GP033C0 chronograph movement. Case size: Ø 46 mm / 15,6 mm. You can download a brochure of the Girard-Perregaux Laureato Bol d’Or Mirabaud chronograph here.